* For Chlorine, this filter is large enough for 4-5 people for a full year. Capacity: 100,000 gallons. * For Chloramine, filter Capacity: 30,000 gallons; 2 people. * Flow Rate: 7-8 GPM. Plenty for homes 2500 square feet or smaller: 1-3 baths. *Because of many unknown variables, filter Capacity is not guaranteed when used with well water. 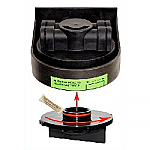 Well owners usually benefit from a sediment pre-filter. Please have well water tested before purchasing any brand water filter. We want to make sure our customers with well water will have their need for safe water addressed by this filter before we sell it. Please have your water quality report and give us a call. If our system isn't right for you, we'll help you find the one that is. 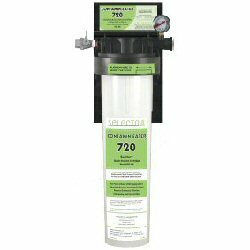 We bought the Contamin-Eater 720 Model because we were concerned about the quality of the water in our area, Orlando Florida. The TTHM levels in our water were through the roof. The Contamin-Eater 720 has been a great aid in keeping the levels low. The odor, texture and color of the water has been greatly improved. We also chose a Selecto product because the price was just right for the huge return in quality. We noticed right away how much better our skin and hair felt! That was almost as great as the improvement in the taste of our water! I installed this filter in our crawl space in about and hour and a half - including having to run to the hardware store for some copper pipe. Not a bad job at all. It was actually fairly simple. Since getting the Contamin-Eater I've bragged so much about it that several of my friends have also gotten one and they are just as happy as I am. Super great customer service too! I want to thank you very much for your wonderful product. We installed the contamin-eater 720 a week ago and the difference in our water is amazing. The most noticeable difference is in our hair--how soft and manageable it is. My daughter has curly hair and has problems with frizzing; according to her, your water filter is "life changing"--she has no more frizzes. It is nice to have "piece of mind" that the water is clean and pure especially in a hot shower. Thank you for taking the time to answer all my questions before purchasing and making the purchase easy. I place the order on Monday and received it on Thursday.